This year will see the 75th anniversary of D-Day, the allied invasion which marked the start of the Battle of Normandy and the eventual liberation of occupied Europe. On 6 June 1944, the largest seaborne invasion in history saw American, British and Canadian forces landed on the Normandy beaches, against ferocious opposition from the German forces and Luftwaffe. It was the major turning point of Word War 2. 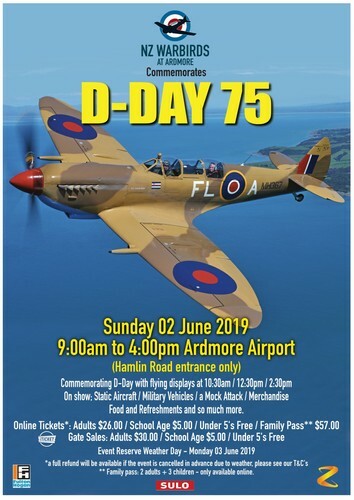 On Sunday 2 June, Queen’s Birthday weekend, NZ Warbirds at Ardmore will commemorate this momentous day with a special event at the Warbirds Ardmore base. Flying displays featuring classic WW2 fighters like the Spitfire and Mustang, mock air attacks and action on the ground by military enthusiasts, vintage military and classic aircraft from around the country, formation flying, and some heart-stopping aerobatics by both military and top civilian pilots will guarantee a great day out, not only for aircraft enthusiasts but the whole family. The RNZAF too will be there, subject to operational requirements. There will be lots to see between displays, with static aircraft, military vehicles, classic cars, food and refreshments and a range of gifts, apparel and aviation souvenirs at the Warbirds shop! There will be a kids’ zone with amusements for children. Gates open at 9.00am with flying displays scheduled at 10.30am, 12.30pm and 2.30pm. Adults $26, school age children $5, under-fives, free. A family pass for 2 adults and 3 children is $57, only available on-line. Gate prices: Adult $30, school age $5 under-fives free. Parking is free – enter via Hamlin Road. If weather is unfavourable, we may postpone the event to Monday 3 June. A decision will be made by 12:00 midday Saturday 01 June 2019. In the event of the show being cancelled in advance due to weather, a full refund of online tickets purchased, will be made. Please refer to our website (www.nzwarbirds.org.nz) for full refund policy and conditions.